... it's time to meet the Mouseketeers! Over recent evenings, Donna and I have been spending at least an hour a night watching the Walt Disney Treasures' THE MICKEY MOUSE CLUB set, devoted to the show's first week of broadcasts in October 1955. Between these episodes, another that's included in the Walt Disney Treasures SPIN AND MARTY set, and episodes from Universal's LEAVE IT TO BEAVER - THE COMPLETE FIRST SEASON, our household -- which traditionally leans toward the Sixties-centric -- has ventured farther back into the 1950s. For me, these early hour-long episodes of THE MICKEY MOUSE CLUB took a little getting used to, because they predate my own memories of the program. In fact, they predate me! But, by the time we ran out of shows to watch, Donna and I were both feeling fairly hooked. We want more, right away, but I have no idea when the next batch of WDT metal-boxed limited editions are due, or if a second volume is scheduled to be included. Some world-weary souls might argue that the MMC was as popular as it was because there were only three channels in those days, but I would argue that its popularity was rooted in a spirit that's still there to be enjoyed by those with an open heart. It's a thoroughly engaging production where everything is done in the spirit of creativity, responsibility and constructive encouragement; it's post-war, but a product of the spirit that won the war -- firm, idealistic, and ready to pitch in and make the most of the today and tomorrow of the Baby Boomer generation. There's an interesting daily feature called "What I Want to Be" that features future GREEN ACRES star Alvy Moore guiding two children through tours of the jobs they aspire to hold one day, as an airline pilot and airline hostess. (The little girl, Pat Morrow, grew up to act on ABC-TV's PEYTON PLACE as Rita, the girlfriend and wife of Christopher Connolly's character, Norman Harrington.) Unfortunately, this segment lasted ten episodes, so we are given only the first half of the entire saga in this initial box set. (Moore also makes a mistake by saying "See you tomorrow!" at the end of the Friday segment, because there were no weekend episodes.) It was an unfortunate bit of strategy that Walt Disney Video chose to issue the show "by the week"; it required a more complete box set -- the first month of broadcasts, at least. Childhood is always kept in perspective on the show, but so is the idea that the world can be a child's oyster, that it's a wonderful and varied place where all their dreams can come true. The daily change of setting within the program -- "Fun with Music Day", "Guest Star Day", "Anything Can Happen Day", "Circus Day" and "Talent Roundup Day" -- is like a mini-world tour in itself, mixing the regular opportunities for creative expression with opportunities for spontaneity and surprise. The Mickey Mouse Newsreels focus on everyday occurrences and may seem quaint today, but they also helped children to see their own activities as special and may have inspired them to raise the bar for themselves in untold personal ways. We see kids having fun, even raising a little... er, heck, but it's never outside the lines of the law or even propriety. If it's sometimes hokey, at least it's never snide or cynical or some other 21st Century alternative. Most of all, the show is just plain healthy and inspiring, due in no small part to the participation of host and resident songwriter, Jimmie Dodd. A fellow Cincinnatian and veteran of the THREE MESQUITEERS B-Westerns, Dodd looks like Lampwick from PINOCCHIO... but, like a select breed of folks who made it through the Great Depression, he embodies the very soul of optimism and community. His songs lend sparkle to each episode, their words full of heart and wisdom and wordplay, and his closing remarks (apparently improvised on a set theme) are warmly advisory without conveying any hint of pushiness. He can even quote Scripture without it seeming an inappropriate intrusion into a secular entertainment -- and, in a supplementary profile of Dodd, the Mouseketeers remember him exactly this way, as a devout Christian who allowed people to have their own spiritual "space" and never intruded upon them with his own beliefs. 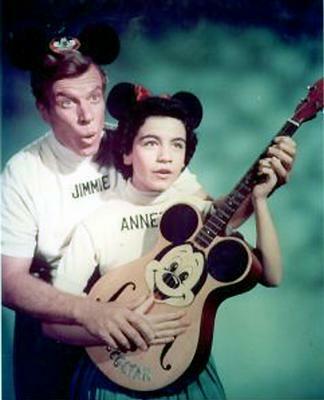 He's the show's lightning conductor and his centrality brings out the very best in all the Mouseketeers who, in these earliest episodes, included not only Annette Funicello but future RIFLEMAN co-star Johnny Crawford (who demonstrates the art of fencing with his older brother Bobby on "Talent Roundup Day"). The first week of shows also gives us a surprise encounter with a surprise Mouseketeer, future DONNA REED SHOW co-star Paul Petersen, who is involved in some heavy-duty acrobatics on "Circus Day" -- but was, I hear, booted out of Mouseketeer camp early on for unruly behavior. A week or so ago, I added some rhubarbs to another blog's reprimanding of Leonard Maltin's endorsement of some less-than-complete-or-ideal WALT DISNEY TREASURES releases, so let me assert here, once again, that he's the ideal host for these releases, no doubt about it. He does an outstanding job of interviewing a select group of veteran Mouseketeers and also SPIN AND MARTY stars Tim Considine and David Stollery on those respective sets, and he's even named an honorary Mouseketeer. Initially, I wished that the MMC set had offered personal updates on all the Mouseketeers, but there are places online where you find out about all that -- and, after Googling up tales of the later, unfortunate misadventures of members like Darlene Gillespie (of CORKY AND THE WHITE SHADOW fame), who performs with such enthusiasm here, I can better understand the company's decision to leave well enough alone. Some viewers may wonder why Karen Pendleton, the raspy-voiced pixie Mouseketeer best remembered in tandem with mite-sized drummer Cubby O'Brien, is shown moving about in a wheelchair; WIKIPEDIA reports that she was involved in a car accident in 1983 that left her paralyzed from the waist down. Watching these shows, you do become interested in all this raw talent and what ultimately became of it.